In accordance with the scheme of arrangement between Manipal Integrated Services and Quess Corp, Quess Corp has made allotment of 71,49,263 equity shares of Rs 10 each to the shareholders of Manipal Integrated Services. Subrata Kumar Nag, Executive, Whole-Time Director and CFO, Quess Corp Limited in an interview with BTVI. Retail portion of Quess Corp offer for sale subscribed 3 times. The report includes a detailed description of key facility management players with information in terms of H.Q, future capacities, key mergers & acquisitions, financial overview, partnerships, collaborations, new product launches and new product developments. Quess Corp, reported the close of its acquisition of a 51% stake Trimax Smart Infraprojects Private limited. Quess is acquiring the stake for INR 20 million (USD $312,000). Trimax is a new firm, first incorporated on 13 July of this year. Quess first announced the acquisition of the stake on 24 November. How is life under the GST regime? Quess Corp Ltd…has completed acquisition of 45 percent equity stake in Simpliance Technologies Pvt Ltd on December 14,” the company said in a filing to the BSE. “When formalisation of economy takes place, opportunities open up for large companies like ours. It’s something we are banking on to a large extent”-cited Amitabh Jaipuria, President and CEO – Global Services, Quess Corp Limited. Thomas Cook India managed to raise more than the planned ₹600 crore from its offer for sale of Quess Corp shares as it was oversubscribed five times on Thursday. The Rs 680-crore offer for sale (OFS) by Quess Corp saw five times more demand the shares on offer. Thomas Cook India and Ajit Isaac, promoters of integrated business service provider Quess Corporation, will raise around Rs 680 crore through an offer for sale to meet regulatory requirement on promoter shareholding in the company. Shares of business services provider Quess Corp Ltd surged as much as 9.5 per cent to Rs 948.45, their highest since July 18 as the company has agreed to buy 51 per cent stake in Tata Business Support Services in a deal worth up to Rs 153 crore ($23.5 million). Quess Corp Limited will own 51 per cent of the Hyderabad-headquartered company, with Tata Sons holding the remaining stake. Motilal Oswal has increased its target price on the shares of Quess Corp, after the company acquired Tata Business Support Services (TBSS) for Rs 153 crore on Monday. We are excited about our partnership with the TATA Group. This investment marks a significant milestone for Quess in its journey to build a world class business services platform. Employing onboarding software solutions can effectively transform the prospective employees onboarding experience thereby saving valuable time for both the organization and the prospective employee. Ajit Isaac, Chairman, Managing Director & CEO, Quess Corp, has used a combination of organic growth and friendly acquisitions to build a company with a market cap of over Rs 11,000 crore. Ajit Isaac, Chairman, Managing Director and CEO, Quess Corp Limited in an interview with CNBCTV18. Ajit Isaac, Chairman, Managing Director and CEO, Quess Corp Limited in an interview with BTVi. Subrata Kumar Nag, Executive, Whole-Time Director and CFO, Quess Corp Limited in an interview with Zee Business. Subrata Kumar Nag, Executive, Whole-Time Director and CFO, Quess Corp Limited in an interview with CNBC Bazaar. Quess Corp, one of the largest contract staffing companies in the country, on Wednesday reported a more than four-fold growth in net profit. Business services provider Quess Corp on Wednesday announced the acquisition of a majority stake in -based Vedang Cellular Services, and a joint venture with another Mum-bai-based firm, Trimax IT Infrastructure and Services to implement a smart city project in Ahmedabad to create city-wide IT Infrastructure. Quess will hold a 51% stake in the joint venture, called Trimax Smart Infraprojects Pvt. Ltd.
Quess Corp has signed definitive agreements to acquire 70 percent equity in Vedang Cellular Services Private Limited with an investment upto Rs 40 crore. In order to understand what agile learning is, it is necessary for us to look beyond the traditional meaning of agile learning and adapt it in the true sense.-Rajesh Sharma, Director – Human Resources, Quess Corp Limited. 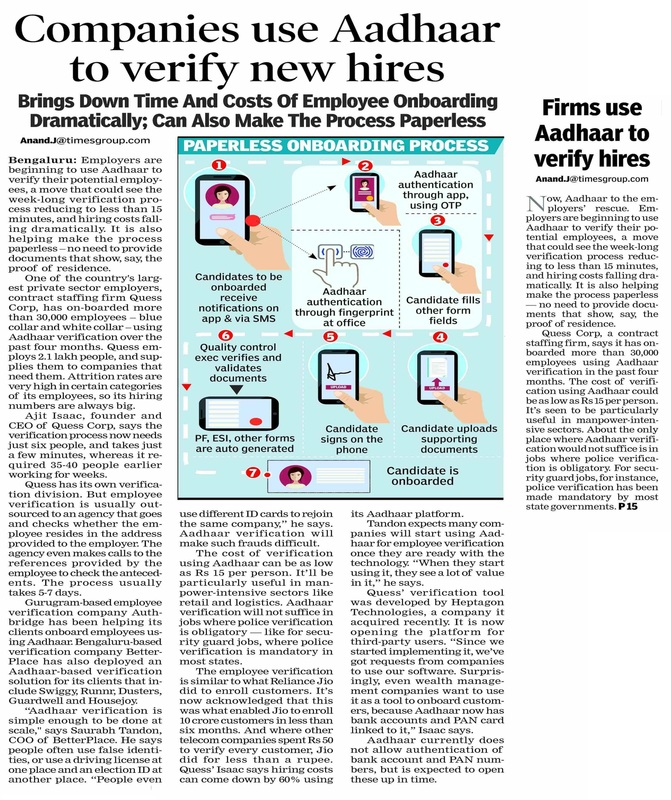 Quess Corp, has on-boarded more than 30,000 employees – blue collar and white collar – using Aadhaar verification over the past four months. Leading integrated business services provider, Quess Corp Limited, spearheads India’s digital transformation with the launch of its state-of-the-art E-onboarding application: Paperless Onboarding Platform (POP). Amitabh Jaipuria, President and CEO – Global Services, Quess Corp Limited in an interview with BTVi. Executive, Whole-Time Director and CFO Subrata Kumar Nag talks about Quess Corp’s investment plans and future growth prospects. Digitisation is another factor that has transformed the way businesses operate, promoting a corruption-free environment that provides the platform for businesses to compete on an equal playing field- Ajit Isaac, CMD and CEO, Quess Corp Limited. These appointments are also aimed at boosting Quess Corp Limited’s expansion plans and inorganic growth. The recent institutional placement programme (IPP) offering undertaken by Quess Corp Limited would help in its continued pursuit of strategic acquisitions.- Subrata Kumar Nag, Executive, Whole-Time Director and CFO, Quess Corp Limited. Quess Corp will raise over Rs 873 crore through allotment of over 1 crore equity shares under its institutional placement programme. From Quess’s perspective we see a more robust growth phase in the business service sectors in the coming years.-Subrata Kumar Nag, Executive, Whole-Time Director and CFO, Quess Corp Limited. Under QIP issueQuess Corp announced that the duly authorized Capital Raising Committee of the Board of Directors of the Company, at its meeting held on 18 August 2017 decided to allot 1,09,24,029 Equity Shares of Rs.10/- each to successful applicants at an issue price of Rs. 800 per Equity Share, aggregating to Rs. 873.92 crore, under QIP Issue. Chairman, Managing Director & CEO Ajit Isaac talks about the Institutional Placement Programme. Quess Corp has proposed an issue of about 1.44 crore shares of face value 10 each to eligible qualified institutional buyers on August 14 (Monday) through an institutional placement programme (IPP). The institutional placement programme offering will see Quess Corp. raise primary capital, diluting slightly less than a 10% stake. Fairfax-controlled business services provider Quess Corp Ltd said on Thursday it plans to raise Rs 1,150 crore ($180 million) through an institutional private placement. Quess Corp rose 1.16% at Rs 897 at 12:42 IST on BSE after the company said it has signed the definitive agreements to acquire 46% equity in Heptagon Technologies. Business service provider Quess Corp, controlled by Canadian investor Prem Watsa, reported 34.2% rise in quarterly profit helped by higher revenue from its IT staffing business. Net profit of Quess Corp rose 34.18% to Rs 33.13 crore in the quarter ended June 2017 as against Rs 24.69 crore during the previous quarter ended June 2016. Quess Corp Ltd announced its financial results for the first quarter that ended on 30th June 2017. Govt focus on infra will open up opportunities in govt-to-consumer space, says Quess chairman. Quess chairman & CEO Ajit Isaac on Friday said the Centre’s focus on improving infrastructure, building world-class smart cities and enhancing delivery of services to citizens will open up opportunities in government-to-consumer space for his Bengaluru-headquartered company. Fastest follow-on offer: Quess eyes Rs 900 crore. Quess, controlled by Prem Watsa’s Fairfax through Thomas Cook, had raised Rs 400 crore through an initial public offer (IPO) exactly a year ago, which was among the top five most oversubscribed public issuances in the past two decades. Subrata Nag, Executive and Wholetime Director and Chief Financial Officer, Quess Corp In an interview with CNBC Awaaz. 3rd phase of recruitment process for Biharvikasmission2017 begins” powered by Quess Corp.
Sources said though the interview panel for final selection of candidates would comprise senior government officials and industry experts, the initial processing of applications and shortlisting of candidates for interview would be done by the recruitment agency Quess Corp Ltd.
Quess Corp has made two recent acquisitions. It had acquired 46 percent in Heptagon Tech for Rs 9.77 crore and 51 percent stake in Singapore’s Comtel Solutions. Organized by the Investor Relations Society of India in association with KPMG, BloombergandBSE, the IR Awards had acknowledged Quess Corp for their promising IPO run. Leading business service provider, Quess Corp Limited, won the award for the ‘Best IPO’ category at the IR Awards 2017.
Business services provider Quess Corp plans to raise about Rs 1,000 crore from institutional investors to fund its expansion, including through acquisitions. Business services provider Quess Corp plans to raise about Rs 1000-Cr from institutional investors to fund its expansion. “I was told that second ventures are riskier than the first one”- Ajit Isaac , CMD & CEO Quess Corp Limited. Business services provider Quess Corp on Wednesday announced a net profit of INR 113 crore – a 40% rise year on year over revenues of INR 4,157 crore for the fiscal year 2016-17. “On the back of strong topline growth, we expanded margins by 96 bps and significantly improved cash generation.”- Ajit Isaac , CMD & CEO Quess Corp Limited. Business services provider Quess Corp hired more than TCS, Infosys and Wipro did in 2016-17, apart from posting upbeat results. Quess Corp FY17 PAT grew 40% to Rs 113.5 cr. Quess Corp reported a 39.8 per cent increase in profit after tax at Rs 113.5 crore for the fiscal year to March 2017. Revenue during 2016-17 for Quess Corp Limited stood at Rs 4,157.4 crore as against Rs 3,435 crore in the same period last year, up 21 per cent. Quess Corp Ltd consolidated revenue for the quarter came in at Rs. 1122.09 crore, registering 12.6% yoy increase. Ajit Isaac, chairman and CEO of staffing firm Quess Corp, said central government rules give private employers the right to decide the retirement age. He said companies could use this to contest the Karnataka government’s decision. Of the companies that have listed during the current financial year, four – Quess Corp, RBL Bank, Ujjivan Financial Services and Mahanagar Gas- have yielded three-digit returns. Quess Corp Limited is looking to tap the opportunities that would emerge when regional airports would be opened up for operations. Ajit Isaac, Chairman and Managing Director, Quess Corp Limited announced as a finalist for the 18th edtion of EY Entrepreneur of the Year award. Quess Corp Limited has acquired 64% stake in Singapore based technology services provider Comtel Solutions. Quess Corp Limited is one of the fifteen stocks in focus. Quess Corp Limited would initially acquire 64% in Comtel while the balance would be acquired in a phased manner over FY18-20. Quess Corp Limited announced that the company has signed definitive agreements to acquire Singapore-based Comtel Solutions. 75 percent of employees go into job search mode because they don’t find the office environment congenial enough. Fairfax-controlled business services provider Quess Corp Ltd has announced the acquisition of a significant minority stake in Coimbatore-based Heptagon Technologies Pvt Ltd, a software development company, as it looks to cut costs and ramp up digitisation of business processes. According to Amitabh Jaipuria, President and CEO – Global Services, Quess Corp Ltd, given that over 10 million youth join the workforce every year, skill building and job creation should be the primary focus for this government. Quess Corp consolidated revenue for the quarter came in at Rs. 1027 crore, registering a 13.4% YoY increase. Integrated business services provider Quess Corp Limited has appointed Amitabh Jaipuria as President – Global Services – Quess Corp. This appointment strengthens Quess’ top leadership team with Jaipuria responsible for Quess’ services business in all geographies.